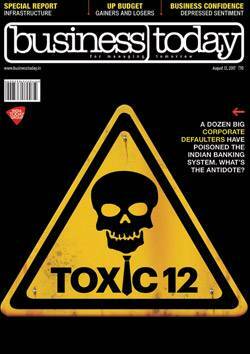 This refers to your cover story on top defaulters of Banks (Zeroing in on the Dozen, Aug 13). The sad part of our banking system is that things move very slowly and by the time defaulters are brought to book, their assets have dwindled down. It is all talk with no concrete results to show. Take the example of the Kingfisher Airlines. Despite a total debt of more than Rs 9,000 crore to pay to banks, Vijay Mallya has just become the self-proclaimed "poster boy" of defaulters. In a series of tweets, Mallya had offered to negotiate with banks for one-time settlement of dues. He is stated to have said that "public sector banks have policies for one-time settlements. Hundreds of borrowers have settled, also. But our offer was rejected by the banks without consideration". Though Mallya appears to be offering an olive branch to the banks, the initial reaction from bankers is decidedly guarded. So, stringent action needs to be taken. This refers to your article on Tata Group (Quick Moves, July 30). The newly appointed Tata Sons CEO N. Chandrasekaran has prioritised restoring communication among the top officials after the unceremonious exit of Cyrus Mistry. This is important in the context of his aim of improving the Group's financial position. The sell-out of its loss-making power plant in Mundra is also a signal of negative times. Chandrasekaran has to consider reducing the number of companies under the Tata Group. The group's joint venture with Singapore Airlines -Vistara, is an area of special attention. Overall, the journey for Chandrasekaran seems to be very tough and testing. And it is only time that will determine whether he overcomes the challenges. This refers to your article on GST (The Die Is Cast, July 30). It has logically expressed and argued for the imperatives of GST from consumers' point of view. Anything new and innovative is always resisted. Once the teething problems of GST are addressed adequately, taxpayers will acquiesce with it. There are obviously many kinks and financial irritants that need to be eased. The warp and weft of GST are being spelt by disputes on multiple tax rates, while the norm is to roll it into a single structure. The composition of GST Council needs a revisit with the inclusion of domain experts. Real estate, alcohol and electricity should also have been brought under its ambit since that could lead to corruption. Keeping petroleum products on Concurrent list of the Centre and States will hurt consumers with possible clash of policies between them on vote-bank politics. Any tax system will be easily accepted, only when it is simple, but the GST mechanism is still beyond the taxpayers' ken. Inflationary pressure cannot be ruled out till the progressive tax rates settle down properly without any scope for manipulation upon taxable slabs. This refers to your article on tea production in Darjeeling (Tea Wars, July 30). In fact, the political turmoil in this hill district of West Bengal has paralysed tea production. But as a tea guzzler, it is quite painful for me to lose the aroma of Darjeeling Tea.